Collecta have released images of the final set of prehistoric animal models due to be introduced next year. The pictures show the new version of the 1:40 scale Ankylosaurus which has received a makeover and the not-to-scale models of Pachycephalosaurus and the Tyrannosaur Daspletosaurus. Armoured dinosaur gets a paint job. The face has been re-painted and there is now a distinctive white patch on the tail club. The bony armour, osteoderms et al are highlighted as they have been painted black. Perhaps one could represent a male whilst the other could be the female of the species. If we take Aves as the basis for this concept then the more colourful one could represent the male of the species. Adding to the company’s range of Tyrannosaurid models comes Daspletosaurus, a real bruiser of a North American Tyrannosaur when compared to its contemporaries Albertosaurus and Gorgosaurus. Such an interesting and unusual pose, a resting Tyrannosaurid. The Pachycephalosaurus is portrayed as a lithe and agile animal. Gone is the pot belly seen in other models of Pachycephalosaurs. As the feet of this animal were quite small, it has proved impossible to stabilise the figure, so it has been mounted on a base. The base is designed to fit together with the Hypsilophodon family set, a sort of coming together of Early and Late Cretaceous Ornithopods. The Pachycephalosaurus base also fits with the prehistoric flora models available from Collecta, the Monathesia and Cycads and of the Williamsonia model. 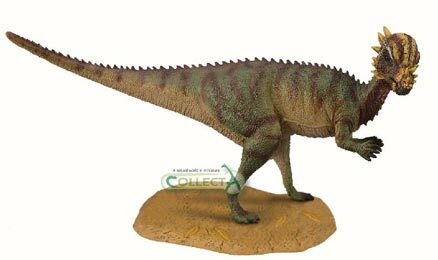 Model Pachycephalosaurus – the Base for your Collection? A lithe Pachycephalosaurus dinosaur model. Although there are only going to be a few new models from Collecta next year the standard remains very high.